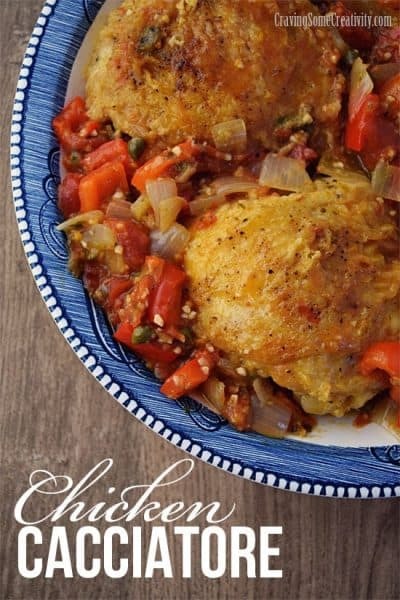 This Chicken Ratatouille Recipe is tender, juicy, and full of flavor! A classic french dish gets a makeover for simplicity and can be easily converted into a crock pot recipe so everyone can afford a few minutes to sit down together! Serve with some crusty bread and you have a complete meal that makes hearty leftovers. Look at that beautiful variety of color! Traditionally, Ratatouille is a summer vegetable dish with zucchini, squash, and eggplant. However, there is a fresh vegetable supply year round at every grocery store so I don’t think that you have to wait till summer. The diced vegetables make a great base for the chicken and the canned tomatoes create the sauce so you want a quality product like Hunt’s. I certainly love big chunks of vegetables in my soups and stews. I like to see what I am eating, that is, except onions. Oh, I definitely don’t mind the mighty onion, but I just don’t need to see them in big chunks. For ratatouille, cutting and chopping the vegetables is definitely the most time-consuming part. I find it to be very relaxing, though. I’m not really sure if it’s knowing that I’m cooking from the soul to feed my family or just the use of sharp objects. After spending all weekend doing some holiday shopping in the crowds, it could be either reason. Now I feel bad for my vegetables! While this Chicken Ratatouille is certainly fancy enough and worthy of serving to your favorite holiday guests this season, it’s so simple that it’s actually easy to change to a crock pot version to serve on the most hectic of weeknights. Toss all ingredients in the crock pot and away you go! Tender, juicy, and full of flavor, this Chicken Ratatouille is a one-pot dinner that your family will love! In a large dutch oven, heat the olive oil over med-high heat. Add the chicken pieces to the pan and fry until brown, about 8 minutes per side. Work in two batches if necessary. Transfer the chicken to a plate lined with paper towels. Reduce heat to medium. Reserve 1 tbsp of the oil liquid in the pan and throw away the rest. In the same pan, add the onion,peppers, garlic, and thyme. Saute until tender, about 4-5 minutes. Add the rest of the vegetables and cook for about 5 minutes. Add the tomatoes. Bring to a simmer. Add the chicken pieces back into the pan and sink them into the sauce. The sauce may not cover the chicken entirely. Continue simmering until the chicken is fully cooked, about 25-30 minutes. Before serving, I often pull the chicken pieces at the end and place them under the oven broiler for 5-10 minutes to make the skin crispy. My mouth is watering! I love squash and will definitely have to try this recipe! YUM!!!! That looks amazing, love all the veggies! I’ve actually never had chicken ratatouille, but it looks pretty fantastic so I think I need to change that ASAP! Oh wow this looks amazing!! Isn’t it amazing what you can do quickly with wonderful canned food items?! It is! And I love canned tomatoes especially since it is one of the few vegetables that really has a best season at the supermarket. Mealy, light winter tomatoes just won’t cut it! This is such a delicious recipe! It’s a good food idea during occasions or holidays, too.